A pair of prosecutors, New York Attorney General Eric Schneiderman and San Francisco District Attorney George Gascón, have been pressing Apple for months over a rash of thefts of mobile devices, including iPhones and iPads. Gascón in particular had been pushing for a 'kill switch' that could permanently disable stolen iOS devices. Today, Gascón and Schneiderman praised Apple's release of the Activation Lock feature in iOS 7, calling it the "world's first attempt to implement a technological solution to the global smartphone theft epidemic". "After months of pressure from a global coalition of elected officials and law enforcement agencies, we are pleased that Apple is set to release a new mobile operating system that includes a theft deterrent feature called Activation Lock. This is an important first step towards ending the global epidemic of smartphone theft. “In the months ahead, it is our hope that Activation Lock will prove to be an effective deterrent to theft, and that the widespread use of this new system will end the victimization of iPhone users, as thieves learn that the devices have no value on the secondary market. We are particularly pleased that – because Activation Lock is a feature associated with Apple's new operating system as opposed to a new device – it will be available to consumers with older phone models who download the free upgrade. 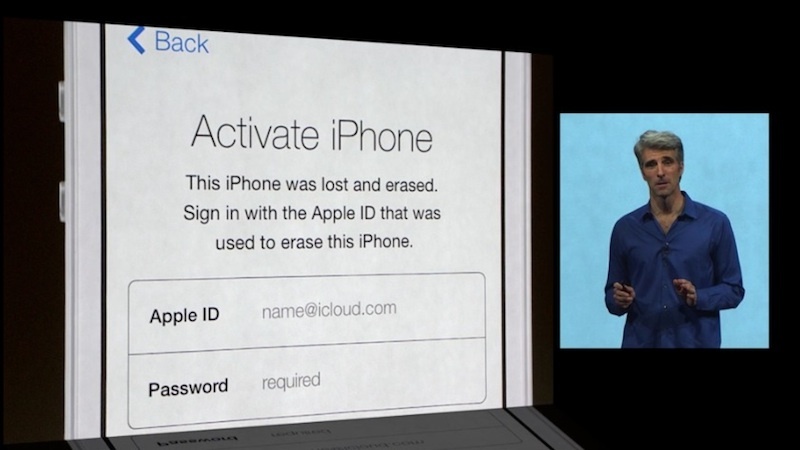 The release goes on to note that while Activation Lock is a "step forward", it is ultimately too early to tell if it will cut down on the so-called "Apple Picking" crimes. "After months of pressure from a global coalition of elected officials and law enforcement agencies..."
Oh politicians! Yes, this feature was magically created after your grand standing... no one ever thought it was a good idea before that or started all work necessary to bring it to fruition. Talk about ego and self-aggrandising! This is great step forward for security. Maybe thefts will be reduced. What happens if you buy someone's old phone on CL and they report it stolen? Do you end up with a brick? How do you delete iTunes activation account all together? When purchasing an iPhone, iPad, or iPod touch from someone other than Apple or an authorized Apple reseller, it is up to you to ensure that the device has been erased and is no longer linked to the previous owner’s account. Wow, Apple is over the media. So, when confronted with this screen, there is no way a potential thief could restore the phone in iTunes somehow bypassing this? That's the idea. No restore of any kind without the original users apple id. Remains to be seen how secure it is. It won't stop theft. Thieves will just use the phones for parts then. Nobody said it would actually stop theft. But it may significantly hinder it. Or at least it will give you the satisfaction that nobody can happily use your stolen phone. Stolen phones can still be re-formatted and hacked. I don't think so. That is exactly what activation lock is designed to prevent. It is a step forward for security only if people activate "Find my Phone" and put a passcode on the iPhone. Since there are studies that indicate that about half of the phones don't even use a passcode to lock the phone, the "Activation Lock" isn't going to be active. So until Apple requires a passcode to install iOS, security will never be complete on the iPhone. Not sure they will "require it", but now users are encouraged to enable it as part of the phone's initial setup. I know this a silly question, but what about a DFU restore? It's been asked and tested before. A DFU restore will not bypass activation lock. I believe the device asks for the activation status when the device goes through apples initial activation. The only potential work around that I can see would be someone redirecting the phone to their own spoofed server and telling the device that it is ok to activate. I hope apple used SSL or some sort of encryption to prevent this from being easily accomplished. Re-formating will do nothing to prevent activation from occurring. It's during the activation that Apple wins. I bet hacking will do nothing to it because jailbreaking occurs after activation.